I've been taking a class at the d.school at Stanford called "d.media - Designing Media that Matters". I took this class out of a desire to learn more about the design aspects of software, as I'd almost entirely come at software from a development angle until then. The class is a crash course on visual design, interaction design, and behavioral design taught through a series of projects. We were asked early on to come up with a topic of a project that we would want to design toward for our final project. Around week three, I chose impostor syndrome. This led to Yana. 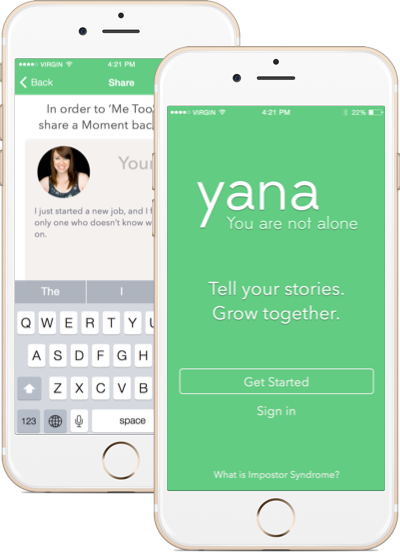 Yana is a mobile app that lets people struggling with impostor syndrome to pseudo-anonymously share their moments of difficulty and overcoming. Other users can acknowledge those Moments with a Thank You or a Me Too. A Thank You is a simple, anonymous acknowledgement that a Moment resonated. Pressing Me Too shares your photo and first name with the author of a Moment and reveals their photo and first name to you. In this way, the Moments that resonate the strongest have an extra human element. If you're looking for more, check out the mock landing page, and I'll update as the project continues.